The season 16 cast of the CBS series NCIS, scheduled to air on the CBS Television Network. 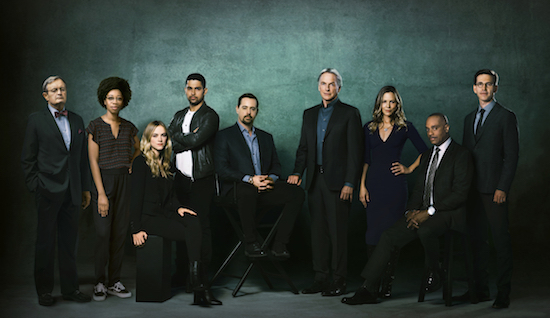 Pictured: David McCallum, Diona Reasonover, Emily Wickersham, Wilmer Valderrama, Sean Murray, Mark Harmon, Maria Bello, Rocky Carroll, Brian Dietzen. Photo: Kevin Lynch/CBS ÃÂÃÂ© 2017 CBS Broadcasting Inc. All Rights Reserved. NCIS will return for season 17, CBS announced. NCIS is the latest show to get the nod for the 2019-2020 season, following the already-picked up YOUNG SHELDON, MOM, CRIMINAL MINDS, FBI, GOD FRIENDED ME, THE NEIGHBORHOOD, and MAGNUM P.I.